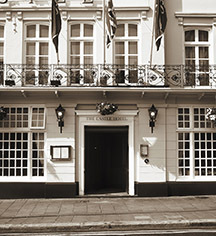 The Castle Hotel Windsor – MGallery by Sofitel started out as a simple inn cloistered within the winding roads of Windsor. Founded in 1582, the inn serviced the tradesmen and laborers who toiled inside the ancient market town. The tavern underwent a significant change to its identity several decades later, however, when its innkeeper, George Pennington, renamed it to “The Mermaid Inn.” Due to the homemade ciders and beers that he brewed onsite, Pennington quickly rose in prominence as its steward. His beverages became so popular that Pennington had to manufacture his own currency to cater to the demand. Pennington distributed his own tokens that depicted a mermaid on their surface. Each one of these special tokens was worth a single drink at the inn! As Windsor blossomed into a vibrant city during the 19th century, so too did The Castle Inn. By the start of the 1800s, The Castle Inn had grown to become one of the region’s grandest hotels. Many illustrious luminaries were soon frequenting the building regularly. The Castle Inn was particularly considered to be among the best places to dine in all of Berkshire, with such prominent individuals like the Duke of Wellington coming to feast on the inn’s fare. Sofitel has operated this magnificent hotel since 2015 as part of its esteemed MGallery collection. Known today as the Castle Hotel Windsor, Sofitel has ushered in a new era of prosperity for the business. Under Sofitel’s stewardship, the building’s rich heritage has been preserved for future generations to enjoy. And even though the building continues to be one of the Windsor’s best hotels, it is also among the city’s most historic landmarks, too. Very little of its interior has changed over the 500 years that the hotel has been in active, with its walls serving as a terrific time capsule for the city’s storied past. 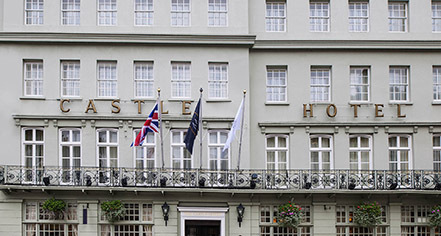 Sofitel invites any traveler passing through Windsor to stop by the stunning Castle Hotel Windsor!